Are you interested in the Hot Pot Solar Cooker? High-performing In sunny and clear conditions, the HOT POT™ will boil a quart of water in under an hour and cook a four-pound chicken in about two hours. Great for healthy and delicious cooking with the power of the sun. Keep the nutrients and vitamins in your food, while giving your dishes an authentic slow-cooked flavor everyone will love. No more burned or greasy food! Portable: Take it with you everywhere you go - the HOT POT™ and its foldable aluminum reflector are easily stowed in a backpack. Durable: The HOT POT™ is a quality manufactured product. From the tempered glass bowl to the steel cooking pot and aluminum reflectors, all parts are rugged and designed for outdoor use to give you many years of solar cooking experiences. Safe: No fire, no smoke, no burns. The HOT POT™ is a safe alternative to any conventional cooking system and suitable for "no open fires" areas. Time saving: With the HOT POT™, there's no need to haul fuel, chop wood or light a fire. Enjoy the outdoors without having to supervise your food - it'll be waiting for you when you get back (just make sure it's out of reach of wildlife!). 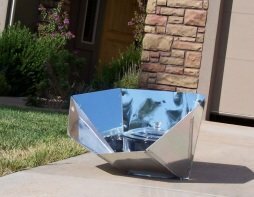 Great value: Tests have shown the HOT POT™ to be the most high-performing solar cooker in its price class. The HOT POT™ is comprised of a 3-quart, black-enameled steel pot supported by its rim inside a covered, transparent, tempered glass bowl and polished aluminum reflector panels. The sun's rays are concentrated by the aluminum reflector and projected through the glass bowl onto the steel pot, which converts solar energy into heat. As there is a half-inch of air space between the steel pot and the glass bowl, heat is retained inside the glass bowl, creating a miniature "greenhouse" effect which maintains cooking temperatures. The Hot Pot can boil water and and any other liquids, it can be a little bit slower than some box cookers (ovens) but it will boil water, especially on a nice sunny day. When you purchase a HOT POT™, you are also supporting an international non-profit initiative which helps eliminate human health and environmental problems associated with indoor smoke and deforestation in developing countries. From Mexico to Mali, Africa, HOT POT™ solar cookers are helping people in poor communities in their efforts to live a better life. *The Hot Pot Solar Cooker is so versatile and practical that we recommend it to almost everyone that inquires about which solar ovens would best serve their needs. In my experiences with solar cookers of different varieties and makes, I have come to appreciate and prefer the "Hot Pot" for its excellent design, high quality, and its overall usefulness for cooking everyday meals. It has become a favorite from among the many solar cookers that I own. In the summer time I can set the Hot Pot with a meal to cook in the morning and come home to a hot and ready meal just four or five hours later. Those who know me know that I own many types of solar cookers for cooking all classes of foods and recipes, but when it comes down to sheer ease, utility and results, I probably use my "Hot Pot" solar cooker just as much, and at times, more often than the other cookers. I have used home made solar cookers made from scratch, as well as the professionally manufactured solar cookers. Both work very well and accomplish the task they were designed for. But, I purchased my manufactured solar cookers with the idea of having precision design and better quality and durability than what I could make myself. I calculated that the cost of my solar "Hot Pot" has been easily recouped within a period of about three months, while my other solar cookers required a bit more time due to the fact that they cost a bit more. Cost savings were based on actual electricity that would be used if I were using conventional ovens and stove tops and the higher cost of air conditioning due to the greater heat and humidity caused by cooking inside the home. On a weekly basis in the summer time, anywhere from three to seven times, I use my "Hot Pot" to cook stews, chili, chicken, spaghetti, eggs, potatoes, rice, wheat, hot dogs, corn on the cob and many other dishes for our family meals. The Hot Pot also works great for reheating leftovers if so desired. Cooks who love their slow cookers will love the HotPot. 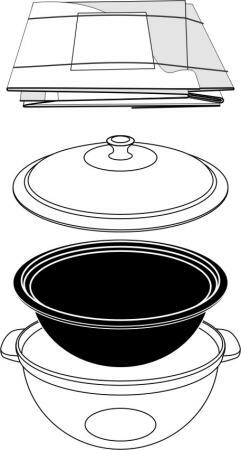 Any of your traditional method Slow cooker recipes can be used in the HotPot when the sun is shining, and the results will be even more flavorful and tender, without costing a cent for power or fuel. On a good day, foods can simmer gently for hours in the Hot Pot, with outstanding results, and the cooker can also bake some kinds of simple breads and cakes. 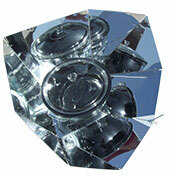 Its efficiency, and convenience make it an excellent choice for anyone wishing to purchase a durable solar cooker. The anodized aluminum solar reflectors will also work with other dark pots in oven bags (or in the case of smaller pots, inside the glass enclosure that is part of the HotPot system), especially if you elevate them on a rack to let light get underneath. Since the reflector folds compactly and is light in weight, it travels well and can go along with a lighter-weight pot and oven bag if you are ever flying somewhere and would like to solar cook when you get there. Since I live in the "hotter" Southwest I am "blessed" to have a greater abundance of days of sunshine; yet even here we can have our challenges with cloudy days during summer monsoon season and in the winter, albeit our cloudy days are fewer than in other parts of the world. Still I have used my solar cookers on windy and minimally sunny days and have realized great results nonetheless. But just because one lives in the rainy Northwest or foggy London doesn't mean that you can never enjoy the benefits and pleasures of solar cooking. The sun does shine in these places also. There are many in such areas that can testify to the feasibility of using solar energy for making delicious sun cooked meals on a frequent basis. Besides using solar I also love to cook with charcoal, gas, Dutch oven, and hardwood grilling. Using these various methods; I feel I have all avenues and possibilities covered, come whatever situation that may. 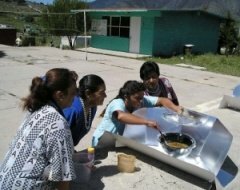 Solar cooking is not the end-all solution to an energy crisis, nor is it the superior and only way to cook; rather it is an economical, proven and practical option among the many that are available to us. I would invite anyone who has even the least bit of interest in this great alternative energy tool to investigate the fascinating possibilities in the world of solar cooking. Below you will find some information on the company that brought the Hot Pot to fruition through the efforts and studies of various peoples and organizations. There are many models of solar ovens in the market today, but none with the price-quality relation as the HotPot. 1) The best models on the market, the SK series by EG Solar or the Sun Oven, for example, are too expensive for those who need them the most. 2) The most affordable model, the inspired CooKit, has improved quality of life for thousands, but it is small, awkward to use, and somewhat frail. With a few notable exceptions, the international philanthropic community has spurned it; it enjoys only modest commercial success. 3) Solar ovens are available at only a fraction of need and even of current demand. Annual production worldwide may be in the thousands, but the need is for hundreds of thousands, even millions if we are to have globally significant impact. SHE, INC.'S INITIATIVE to address these challenges, SHE, Inc. opted for a simple "panel" oven invented by French physicist Roger Bernard. In the 1990's, volunteers of Solar Cookers International adapted Dr. Bernard's idea for their CooKit, a cooker with a cardboard reflector widely accepted in refugee camps. In consultation with Dr. Bernard, SCI volunteers, the Florida Solar Energy Center and others, SHE, Inc. upgraded the proven CooKit to address the challenges described above. This, we named the HotPot. While remaining inexpensive, the HotPot is larger, more durable, more efficient and easier to use. It has great commercial appeal.